In under three years Project Why's personal attention has changed all that. In the recent school examinations, pass percentage among the Project Why children was 98%. More and more parents are bringing their children over and more neighbourhoods are asking Project Why to start branches there. At Giri Nagar there is a PTA, an Annual Day, street sports, cultural programmes, picnics and above all dollops of cheer and hope. Main Street Giri Nagar throbs with energy radiating from Project Why offices. Loud sing alongs of children, people bustling about purposefully and neighbours pitching in to help are everyday happenings. But early days were not so. Anuradha faced surliness and deep distrust. She was evicted from a park where she used to hold classes, driven out by shack-owners and even openly abused. But she has stood her ground and won the neighbourhood over. 'Lala' Baburam now a mild mannered employee running the crafts shop, says he thought Anuradha was seeking religious conversions. Many others like him greet her warmly today. She calls Rani --a Giri Nagar local-- her 'executive assistant'. Rani takes care of the roster, time tables and very frequently, finding a home that would host a class in a hurry. There are constant improvisations to survive and run the classes. Rani says cheerfully, "Majboori ka naam Mahatma Gandhi!" ["When you face an obstacle, invoke Mahatma Gandhi"]. Bernie handles the external world: donors, visitors and the correspondence. Young Shamika is happiest caring for children with debilities and teaching English to eager eyed classes. Money is of course a constant worry as Anuradha must spring Rs.85,000 every month. Whenever she is short --which is often-- she dips into her inheritance. But she says it's worth it and very satisfying. It sure must be, for she seldom dismisses a problem as not being hers. 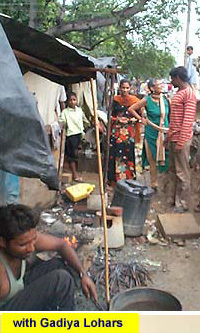 For example, a small tribe of Gadiya Lohars have lived for close to fifty years on Kalkaji Road foot-paths. They are registered voters, have ration cards and yet are regularly hounded by petty municipal officials. Anuradha speaks up for their rights: "They are such a handsome, gentle people. They are itinerant blacksmiths. They used to follow armies in their exquisitely carved carts --'gadiyas'-- and service the arms and the horseshoes. Now they are treated as undesirables. They have a right to existence." When three year old Utpal's indifferent mother ignored his safety, the poor boy fell into boiling curry and sustained third degree burns. Project Why jumped in, treated Utpal and nursed him back to his smiling ways again. There is young Hussain a runaway from Bihar, who began as a floor sweeper at a computer company, got interested and has mastered enough to teach computers to others. Two young children went missing one evening and were found dead in a drain.